This set of 6 Clinch-It Bag Closure Clips will be a life saver in your kitchen and pantry. 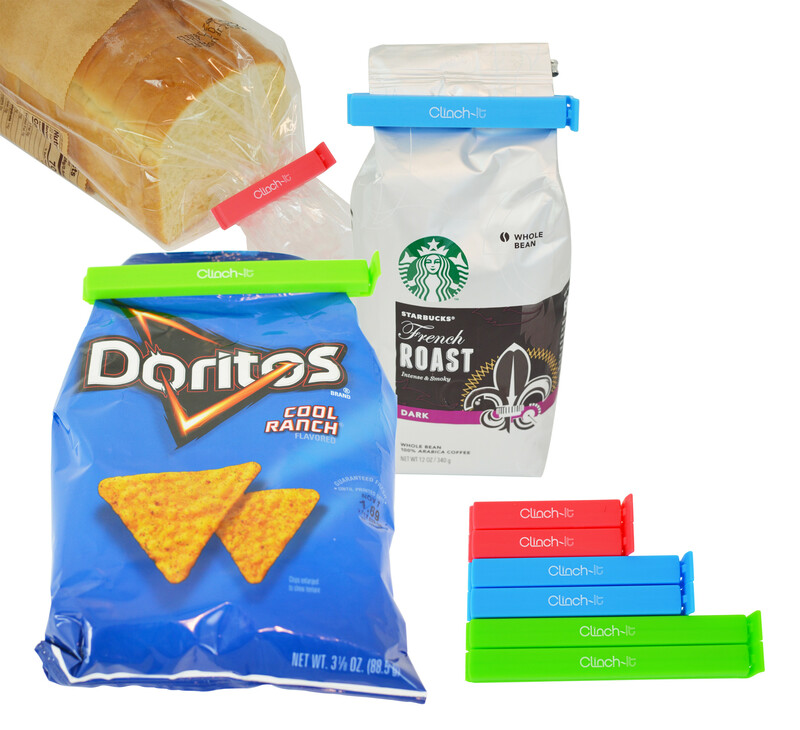 Stale chips and bread have met their match with our Clinch-It Bag Closure Clips. Coffee will stay as fresh as the day it was ground. Includes three sizes. This set of 6 Clinch-It Bag Closure Clips will be a life saver in your kitchen and pantry. Stale chips and bread have met their match with our Clinch-It Bag Closure Clips. Coffee will stay as fresh as the day it was ground. Includes three sizes. Small - seal length is 2.68" and is perfect for candy bars, crackers, and other small items that a big clip just gets in the way when used. Works great for food on the go and would easily fit in a backpack, purse, or even a pocket. Also works well for bagged bread. Medium - seal length is 3.82" and is perfect for coffee, bagged seasonings, cheese blocks, and similar sized items. Large - seal length is 5.00" and is great for small chip bags, snacks, chocolate chips, and is also a great size for other smaller bagged baking ingredients as well. Six piece set includes two of each size clip.